You use the bath towels in your house every day, whether you’re finishing up a shower, handing a towel to a kid after a leisurely bath or using a towel to dry off an adorable pet who romped through the rain. For all these situations and more, Towel Super Center offers 24x50 white bath towels that are practical and affordable. If you’re looking for towels that can withstand multiple washings, Towel Super Center has you covered. 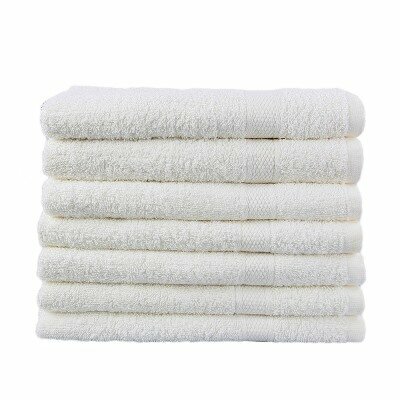 Our manufacturer employs the highest-quality materials to make our towels. We want them to hold up through regular washing and the everyday wear-and-tear that happens in any family’s household. By choosing white bath towels, you get a color that goes with just about anything. Neutral white nicely complements your bathroom décor, giving it a sophisticated and classy look. The size of our towels, a generous 24x50, ensures your family members are covered — whether they are a kid or an adult. Treat yourself and your family to bath towels that feel soft on your skin and that will stand the test of time. Contact us today to buy your new white towels.